Combining function and flexibility, Quartet Motion Dry-Erase Boards are designed with contemporary work environments in mind. The lightweight board goes anywhere from personal workstation to meeting room. The durable dry-erase surface resists stains and ghosts, making the ideal communication space for your personal workspace. From organizing daily tasks to on-the-go presentations, these 2 lb. boards are office essentials. The convenient built-in accessory tray comes complete with a Quartet marker and eraser. 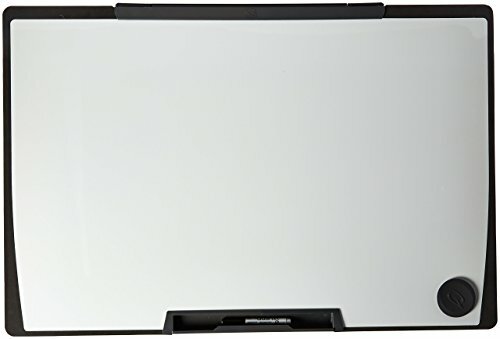 Depend on the lightweight dry-erase board for a mobile presentation companion or on-the-run note taking. Built-in swivel hangers attach on top of most office surfaces, including cubicle walls. Trust the standard dry-erase surface to resist stains and ghosting. Transport the lightweight, 2 lbs. board with ease. Includes a Quartet dry-erase marker and eraser.